Today Roy and I tasted the new Imperial Green Oolong. This tea has long been a customer favorite so the bar is high in terms of not disappointing fans of previous vintages. Actually we were going to taste several new green teas afterwards, but this delicious Taiwanese tea was so robust and flavorful that we brewed it eight times and decided to try the green tea another day. This year's selection is from Shan Lin Xi (杉林溪), at an elevation around 1,800 meters. 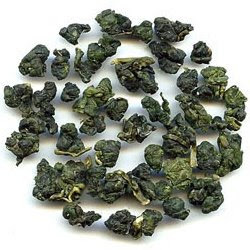 This type of spring-harvested high-grown green oolong typically has a fresh, green, leafy flavor with more muted florals than lower altitude varieties. We sprinkled the bottom of a six-ounce gaiwan with tightly rolled leaves and were surprised, upon weighing them, to see that they came to almost 10 grams. It doesn't look like a lot of tea at first, but after a couple of infusions, when the leaves fully opened, they were almost bursting out of the gaiwan! The extremely tight roll slows down the process of extracting all the flavor the leaves have to offer; that's one reason this tea can hold up for eight or more infusions. At home, you might want to try a little less tea (6-7 grams) infused a bit longer, because it's easy to overbrew with such a large leaf volume. Better yet, experiment to learn the best method to suit your taste. In any case, Roy set the programmable digital kettle for 200 degrees and brewed 9.5 grams for 45 seconds, intermittently paddling the infusion with the gaiwan lid to release heat and stir the large leaves around, so as to fully expose them to the hot water. Decant into a pitcher, then pour into serving cups but let the liquor cool a minute or two before drinking. Consuming a slightly cooler brew allows a better experience of this tea's extraordinary viscosity and multidimensional flavor. The things that struck us in the first brew were the thick, mouth-coating viscosity combined with a delicious fresh, green leafy flavor that are distinctive to Shan Lin Xi oolongs. We didn't taste a lot of florals in the first brew, but they began to come out in the aftertaste. In the second brew the leaves unfurled further and gave a different character. The water had cooled a bit, to around 195 degrees, so Roy steeped a little longer; perhaps a minute. By now the florals were beginning to emerge--a flavor Roy said reminded him of lilacs--while the viscosity remained as rich as in the first round; in fact, it might have been even thicker. We were brewing in a gaiwan, but Roy commented that a tea this complex and multifaceted is ideal for gong fu preparation because it allows the brewer to show off his skill by tweaking different characteristics of the tea for different effects. A tea like this one gives a gong fu expert something to work with. For the third steeping we cranked the digital kettle up to 205 degrees and returned to a 45-second infusion. The tea tasted more floral, while the viscosity was undiminished. At this stage the viscosity and floral elements combined into a notable and pleasant floral aftertaste. Roy commented on how different each brew tasted, and how you can just keep brewing this tea for an afternoon, enjoying the way it evolves. We eventually steeped it eight times and there was still plenty of flavor and viscosity. To ensure this longevity when you brew at home, Roy advises using plenty of leaves and carefully monitoring steeping time as well both the brewing and drinking temperatures. Green oolongs are famed for their cha qi, and one manifestation of this elusive force is to stimulate conversation. As we worked through the eight infusions and chatted about the tea, Roy became enthusiastic about giving tea classes where he can share this and some of the other terrific 2009 harvest selections with customers. We tentatively agreed on the morning of May 31 at the Ferry Building and the evening of June 7 in Berkeley. If you're interested drop us a line at customerservice@imperialtea.com or stay tuned to the blog. We'll be announcing details in the next few days. Don't Miss the Tea Classes with Roy!